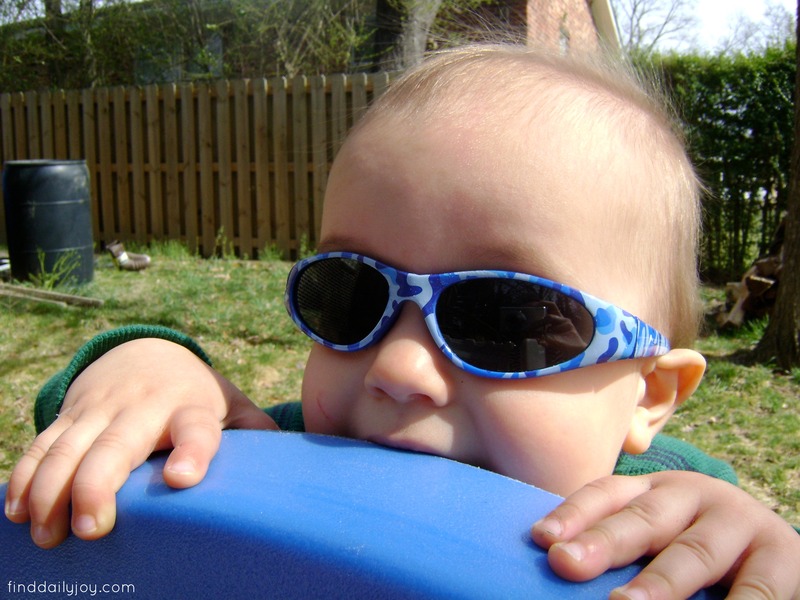 You may remember in my last Friday 5 I shared a picture of Henry sporting his new sunglasses. 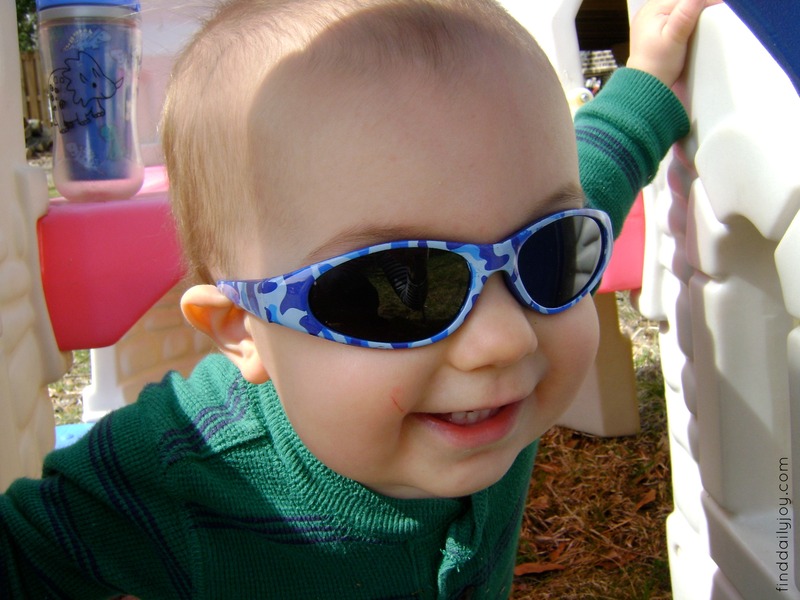 We found these baby sunglasses at Dollar General for $2.00. Score! But I knew that he wouldn’t leave regular sunglasses on for more than two seconds so I wanted them to have a strap. 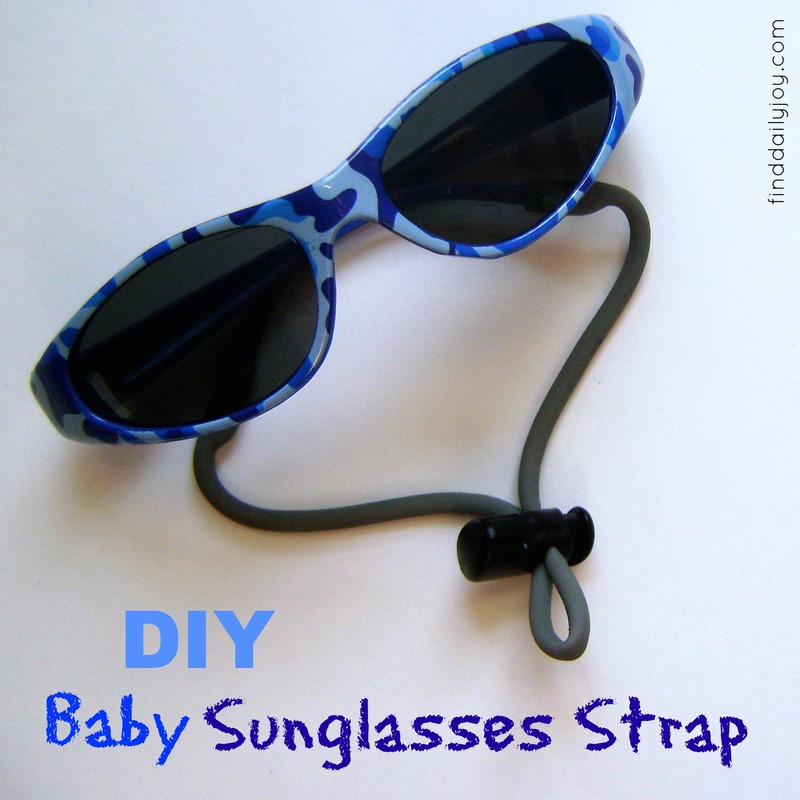 By gathering some items we had around the house I was able to make my own sunglasses strap! The hardest part of this project will be to find a narrow piece of rubber tube. I asked Stephen if he knew where I might be able to find a tube and said he might have something. He went out to the garage and came back in just a few minutes with the perfect length of flexible rubber tube! Turns out he had taken apart an old printer a few days before and had saved the tubes that the ink flowed through. I would imagine you could find something similar at a home improvement store. The project is very simple and hardly requires a tutorial but here it goes anyway. Measured the distance across the back of the child’s head from ear to ear and add a few inches (my strap is about 9″ long). 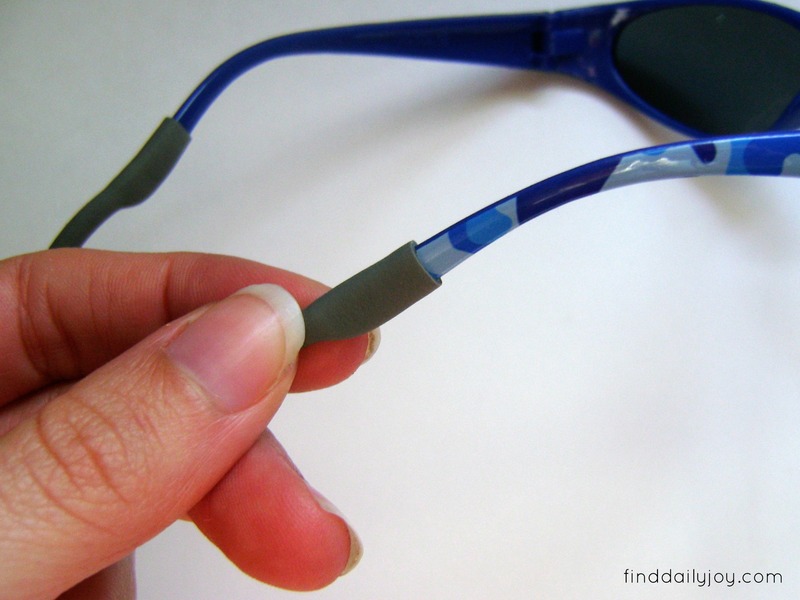 Cut the tube to your desired length and then slide the ends of the tube onto the ends of the earpieces. 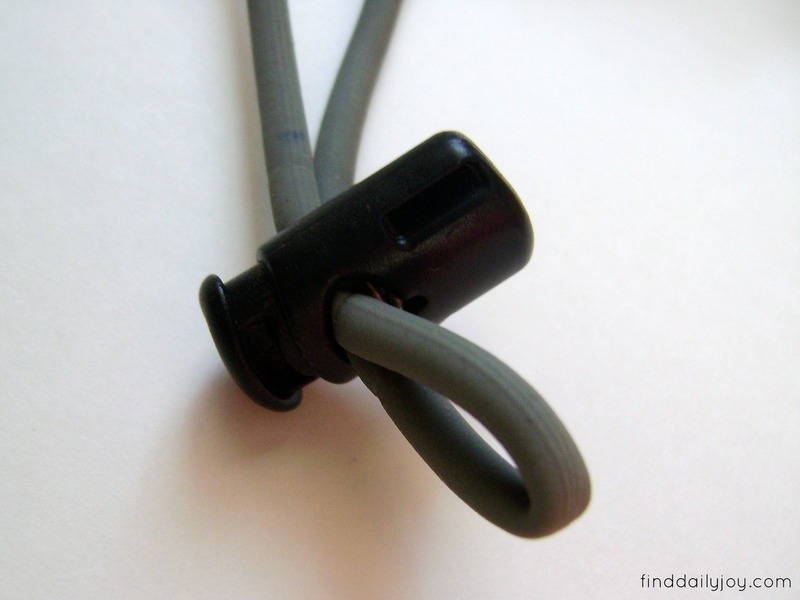 Pinch the center of the tube together and slide on a cord lock toggle. 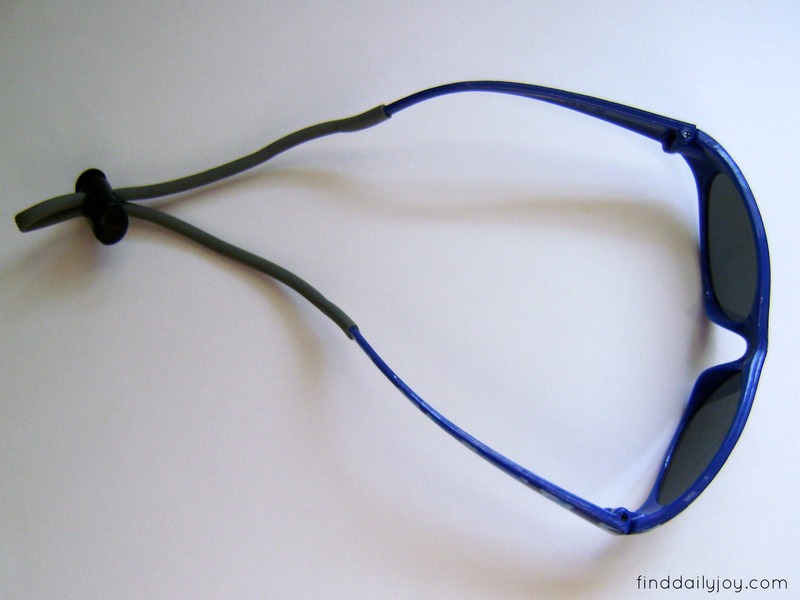 If you use a toggle with two holes you will have to thread the tube through the toggle before you slide the tube ends onto the earpieces. Now you can easily adjust the toggle to tighten and loosen the strap. 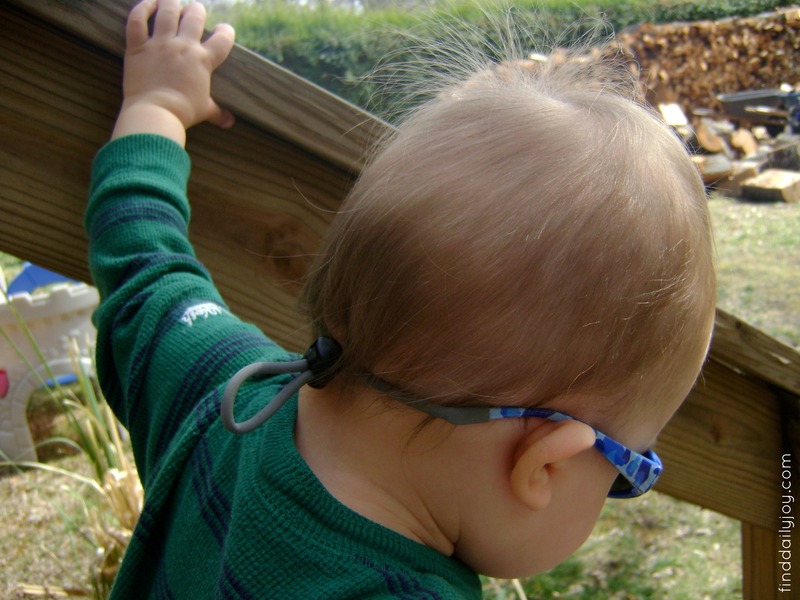 After adding the strap I put the sunglasses on Henry when he was outside. He tried to take them off right away but once he felt the resistance of the strap he gave up and was quickly distracted by an interesting stick laying in the dirt. I was excited to see that he forgot all about the fact he was waring the sunglasses and didn’t mess with them the rest of the time we were outside. Success! Bring on the sunshine. We are ready! Thanks! I’m thrilled with how well the strap works. Love this idea! What do you suspect this tubing would be called or where it would be located at a home improvement store, like Home Depot?